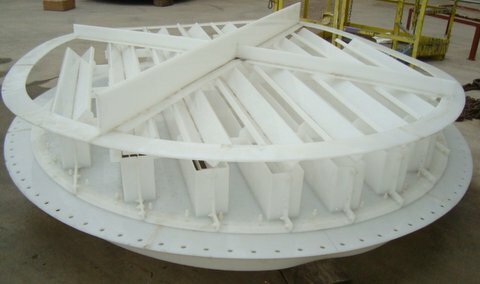 It is similar in design to the orthodox perforated tray distributor with gas risers, comprising a flat, perforated plate with a number rectangular gas vents. These vents or chimneys have V-shaped ‘caps’ over them to prevent falling liquid from above and bypassing them. Sometimes bars are located across the bottom of the risers to prevent any fluidised packing migrating upwards from the bed underneath. This allows the plate to double-up as a bed limiter. Depending on the application and the column, the Re-distributor can be supplied one piece or in sections to allow easy installation through an access manway. Additional support beams should be considered in larger towers to provide the necessary structural support. The Re-distributor can be fabricated and supplied in a range of thermoplastics, stainless steels or alloys. PLEASE TELEPHONE US FOR ANY TECHNICAL ASSISTANCE YOU REQUIRE OR ALTERNATIVELY COMPLETE AND E-MAIL THE TOWER INTERNALS ENQUIRY FORM FOR A PROMPT REPLY.